HE'S QUITE A JIM ! I have gotten to know Saranac Lake's Jim Hoyt a little bit. He's not much of a talker if he doesn't know you... and he didn't know me much for a while. But, seeing as I was a good friend of HIS friend, Wes “Slugger” Moody, we were going to get to know each other after a fashion. 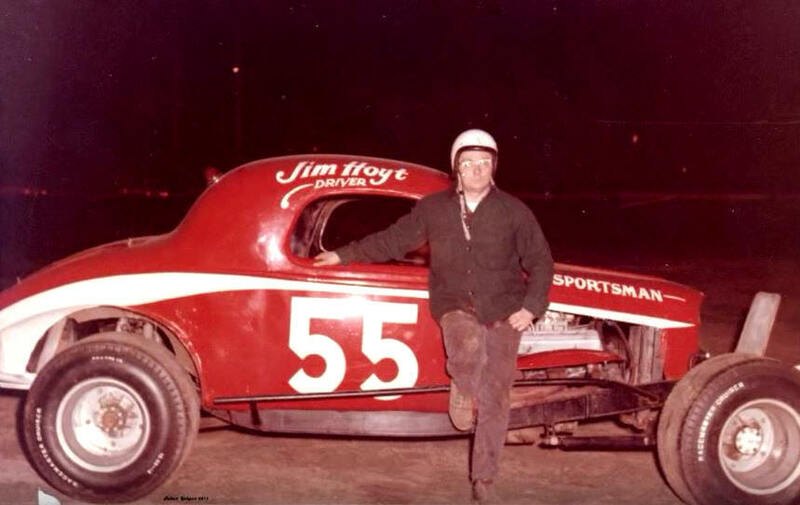 I would see Jim around a car he was involved in – the #55 of Matt Woodruff,from Bloomingdale – who was then racing at Airborne in the earlier days of the dirt cars on pavement era. Jim's presence was marked by occasional spits into a bottle as he surveyed the surroundings with the one eye that wasn't protected by an eyepatch on his glasses. Racing accident ?, I presumed. Nope, skiing accident [and the sentence was about that long]. An active member of the ski patrol into his 70's, Jim Hoyt is still an active man. He slipped into our conversation how he had driven the Woodruff modified, but that his wife, a European – born skier, would not have given that the big OK.
had the patience of a saint with Wes and Jim. Wes speaks of him with a fondness reserved for few. Jim, along with inseparable friend, Wes Moody, grew up in the busy town of Saranac Lake, the community that was formed by a tuberculosis sanitarium but was now defined by the ski and winter recreation industry. The son of local Chrysler – Plymouth dealer Aaron Hoyt, the boys were taken with cars early on [and never let go]. Both were hellions – Moody coming by it naturally through his flamboyant family heritage; and Jim – mostly from being around Wes. The two teenage hellions about drove the diminutive, Aaron crazy, even though he had the patience of Job. It was a regular occurrence to have the boys show up at the Lakeside car dealership with a couple of equally – cantankerous girl classmates in tow. The girls, who loved the little, pleasant Aaron, would pick on him incessantly, with the complete support of the boys. One of the girls liked to climb up on a ladder which used to retrieve car parts from high shelves. She would time this as Aaron walked near and “capture” him under her skirt while laughing uproariously. The Lakeside Garage, having switched over from a Kaiser franchise, was now the home of Chrysler and teen age hijinks. When the poor Mr. Hoyt was not avoiding ladders or getting kissing sneak attacks upon his person, he had much bigger worries about Jim and Wes. 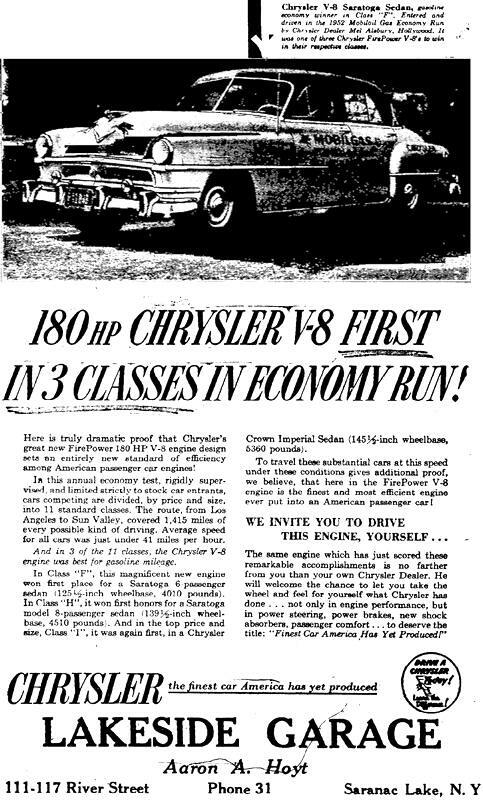 One time, a local man ordered a pair of very rare, limited edition Hemis [ probably Dodges]. When they arrived, Aaron did not happen to be around. So, the boys decided to take out the cars and “see what they'd do”. Moody admits that one of them managed to twist some engine part over - torquing it and Aaron had to pay out big time [and fast] to get ti fixed. He never yelled at either boy. Another time, a mechanic accidentally hit the gas instead of the brake on a new car and jumped it off the lift. Aaron wanted the car out of sight until it could have body work, so he made the mistake of having his son take it over to their home. A neighbor soon called the garage and let Aaron know that “one of your cars just went by my house on two wheels”. This might have been one reason why Aaron Hoyt decided to build a race track on some of the land on his farm, about ten minutes up the road from the dealership. Saranac lake Speedway always had a homey touch to it . Here NASCAR Chief Pit Steward Kay Hanson enjoys the company at the registration table. Registration TABLE ! Not a booth. Below -| An early shot of race action at Saranac Lake, with Henry Jarvis going by. Yes, Aaron's barn WAS that close to the track. Saranac Lake Speedway was interesting from the gitgo. It was built with a very small amount of equipment, and much of the work was done by the two crazies, assisted by a very neighbor from a large local family – Brian Ross. He was easily as unbalanced as the other two, although few people who know him today can believe that. Lacking much to spread the imported clay around the track, Jim would get an old dump truck going backwards, with a full head of steam, and then jam on the brakes – letting the dirt fly out the back. He finally managed to have the dump box fly off with the dirt after a while. The little backwoods track did pretty well, operating on Friday night, when few other tracks were running. The Hoyt family all pitched in to help. The track had trouble making ends meet because it was so easy to sneak in and watch races for free. Even the prominent Dr. Trudeau, of the famous family that founded the world – reknown sanitarium in town, would drive a horse and buggy through the woods and park there, getting a free show. Aaron found a way to get into the 1965 Daytona Speedweeks free – bring a pace car. He wasn't too happy to have to rent a Chevy, seeing as he had flown down to Florida. Below - The unbelievable Moody's Goose was not the biggest drawing card at the track but it kickstarted a long career. First, Wes Moody got the racing bug and bought a 1920's sedan from someone. Calling it “Moody's Goose”, he smoked around the track, chasing much more sophisticated race cars until he blew it up. The next Moody car would be much better. Jim, with help from Wes, traveled down to Hudson Falls to see Henry Caputo, a big – time race car owner at the time. Caputo had been running a two – car team, and one of them was a Plymouth. 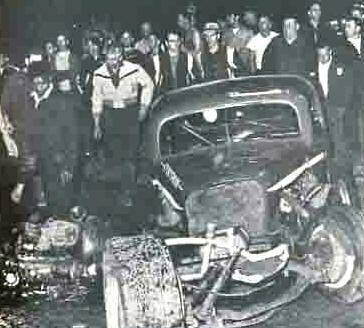 The car had been wrecked by George Baumgardner, but the two bought it anyway. Both have told me that they soon discovered the red and white Mopar coupe was spent. Too much age, not making the considerable repairs worth it. But Jim went ahead and built his own Plymouth coupe. The car car was beautiful. Early 8MM footage for Saranac Lake Speedway show Hoyt firing the Plymouth up and driving out onto his father's track. They don't talk much about the red car # 5 ½. making me think it didn't amount to much. I have seen only one photo if it in action. Wes, at this time, had a '37 Ford, the Moody's Boat Livery car #66. The Caputo Plymouth [show here with Jeep Herbert at Fonda] was pretty well used up by the time Jim got it. Below – Wes Moody's much – improved second car with a family ad on the side. The two worked constantly on race cars and racing engines. At least once, something built in the basement of the Hoyt homestead necessitated the removal of portions of the wall to get the creation out. Moody would go down to New Jersey to see famed car builder Don House, whom he knew. He came back with one of the famous House XL-1's, another Ford. Wes numbered the car 55A, as Hoyt decided he would start running the number 55, as a sort of mathematical playoff on the former number 5 ½.
Jim heads out with the snazzy new Plymouth coupe, Cromwell helmet and all. Below - Jim, at speed at Airborne, leading Junior Bruno. 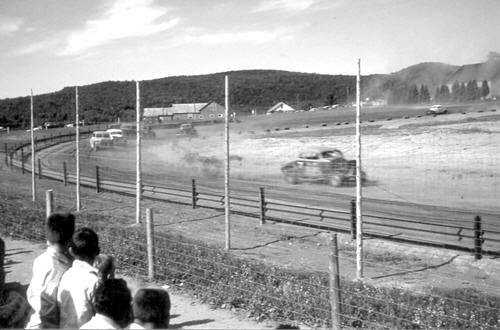 Fonda Speedway, called the Track of Champions practically since its inception in 1953, was where the gods went to race. 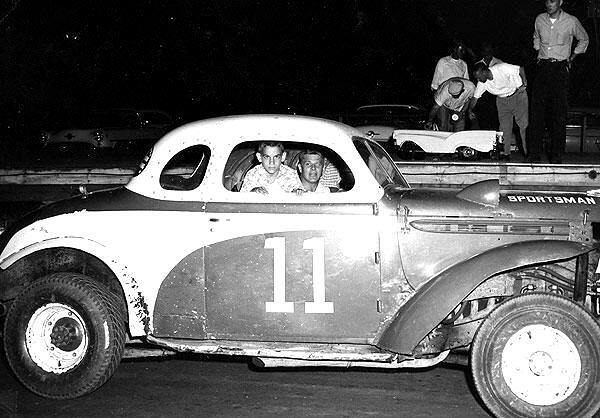 On many given Saturday night drivers such as Bill Wimble, Pete Corey, Lou Lazarro, Kenny Shoemaker, Steve Danish, Jeep Herbert, Howie Westervelt, Jim Luke, and many more raced every week. Other greats such as Rene Charland, Ed Ortiz and more would invade. Fonda regulars hated invaders and were often very rough with them. After incursions by northern New Yorkers like Bob Bruno and the pugnacious Buck Holliday, Wes and Jim it was time to go down and show those bastards what real men raced like. Moody had his share of scrapes with Fonda regulars – particular Robbie Kotary, from the roofing family of Rome, NY. He and Hoyt were in the pits, one Saturday night, and they were very tired of bangs on the tracks and comments in the pits. Moody's fuel tank was leaking and they had to do something about it. The two of them knew a gas tank had practically no chance of exploding if was totally full – leaving no air. be his first maroon and white 63 at Saranac Lake Speedway, with Aaron Hoyt's barn looking in the background. Growling and cursing at anyone nearby, Moody grabbed a torch and began welding on the gas tank. Sparks were flying all over, and panic – struck Fonda pit flies were joining some of the racers, scattering about in a frantic run for their very lives. Moody and Jim had a few choice words for the lot of them, while laughing wickedly and heading out – unscathed for the next race. People kind of avoided them after that. Jim's next visit to the track was considerably more auspicious than anything the colorful Moody ever managed. Hoyt had the Bellinger – inspired thre window coupe. He allowed to me that they had “cheesecaked” that frame pretty bad while setting it up as a pavement car. Cheesecake, to Jim apparently meant the frame was full of modifications for weight reduction. What no one had figured out was that the old Fonda track seemed ideally suited for a pavement car to handle beautifully on clay. Jim Hoyt proudly poses with “the cheesecake car” - obviously sometime before the fateful Fonda race program. Below – Don Stumpf, whose success at Fonda with a pavement car caused another legendary Fonda crash. 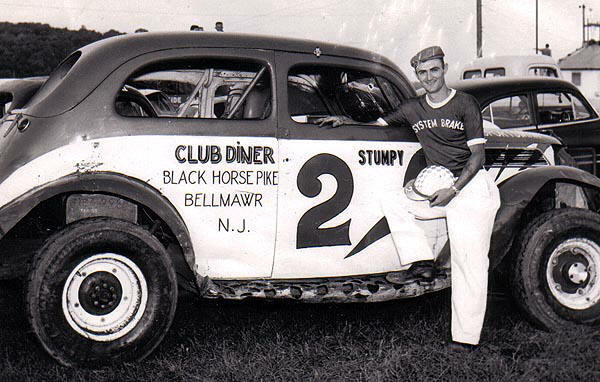 If no one had noticed, Don Stumpf, a Wall Stadium [pavement] regular had slipped in on a Saturday night in the 1950's and ran off with a feature win in his #2 sedan. Later, people would be amazed at how fast Charland would be with the Czepiel 888, a car built by Fred Rosner for asphalt. 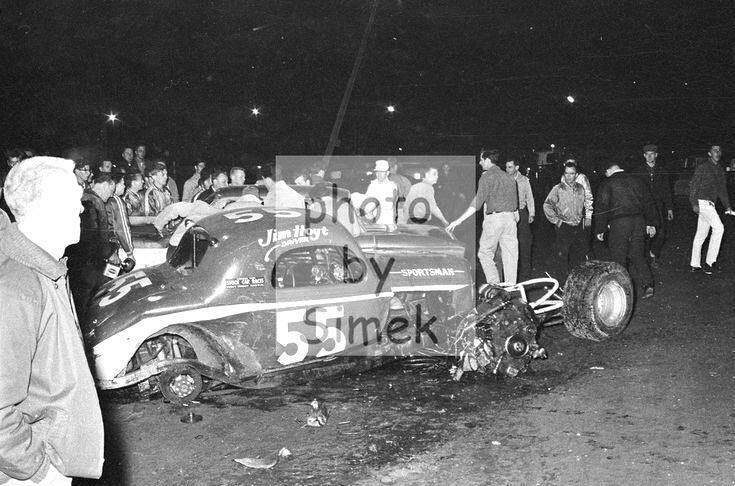 At any rate, the unknown Jim was turning heads that night, showing some unexpected speed with the red 55. The car was doing well among the track regulars, although it certainly looked different in going around the corners than the dirt cars. This was 1964, and I wasn't familiar with Jim,. But I particularly noticed this in turn two – enough to catch your attention. As I recall [and I was there], he was coming into the front straightaway when he tangled with another invader, George Janoski from Stafford Springs, Connecticut. 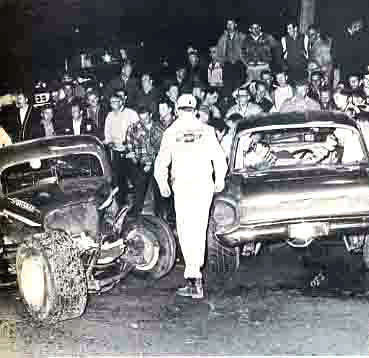 With many Fonda teams regulaly invading his how track, Stafford Springs [which still dirt then], Janoski made a number of visits to Fonda in that time period with his bronze and white Furness Brothers #40 CT. A news article states it was Jerry Townley and it all happened in the third turn. At any rate, Hoyt went for a tumble that would have rated as one of the five all – time Fonda wrecks – had they been able to find a photo for the Fonda history book at the time. Fonda. Below – Another view of the same wreckage. The car next to Hoyt is likely the Falcon of Irv Taylor. The car was flying at the time and it flew even higher down the stretch. The cheesecaked frame did not hold up, as the body stayed on but the drive train ended up separated from the frame. The motor sat beside the car. Jim was pretty seriously injured, including four broken ribs, and had to spend time in one of the local hospitals before getting back home to Saranac Lake. Mr. and Mrs, Aaron Hoyt were not thrilled that the pieces of the car made it home before their boy did. Jim would have to be satisfied being around racing through helping at the home track. Wes Moody, who became a bigger name with each passing season, was still trying to run his maroon and white #63 coupes at Saranac Lake on a Friday night. On one particular Friday evening, he had a new car out at the track. People began looking at each other funny when the car took the track and began doing hot laps while Wes was seen standing in the infield. former crew chief Fran Kane and Andy Costello. Hoyt's and Woodruff's 55 pits would be just out of sight on the left, beside George Foley. It was Jim, out there, putting the car through its paces on that rough dirt track with a drainage tube still protruding from the injuries to his body. A resolute Aaron Hoyt led a contingent of the family out, onto the track where they linked hands and stood across the track, forcing their recalcitrant Jimmy to slow down and pull off, back to the Moody pit area. That seems to have been the last real racing Jim Hoyt was able to do. He would continue his regular skiing and ski patrol work, even though an accident there badly damaged an eye. The beloved family race track survived into the later 1960's before giving up the ghost. Moody would race for at least decade more, finding notoriety and controversy at every step. He and Jim would find themselves, in the mid 2000's parked next to each other in the Airborne Speedway pits, watching younger drivers race their cars. It is from then that I got these details, so correctness depends on their accuracy You can still find the old Hoyt race track [with some difficulty], and you can still find Jim Hoyt – if ya know where to look. Two last looks at the cheesecake car: before and after. He's quite a Jim !